A series of civil lawsuits concerning cyber squatting has taken place successively or simultaneously in China since the end of 1990s when “.cn” was opened for registration. The typical cases in this regard included the “IKEA” case, “DuPont” case and others. The early period has witnessed the irreplaceable role civil procedure has played in the settlement of cyber piracy. Domain name disputes mushroomed in court for resolution one after another from 1999 to 2002. Consequently, many people were summoned by IP Tribunals of People’s Courts with subpoenas. They were sued by IP right holders, including trademark prior right owners, at home and abroad, for their domain squatting by exploiting the loopholes of China’s internet order. Domain name lawsuits had become a fashion and received wide public attention during this period. A non-litigation procedure was established for domain name dispute settlement, including “.cn” and Chinese character domain name, after Domain Name Dispute Resolution Policy (DNDRP) of China National Network Information Center (CNNIC) came into effect in September, 2002. This dispute settlement mechanism is more efficient and convenient than civil procedure. DNDRP was formulated in accordance with and similar to Uniform Domain Name Dispute Resolution Policy (UDRP) of Internet Corporation for Assigned Names and Numbers (ICANN) in 1999, which was adopted by ICANN for the resolution of “.com” and “.org” domain name disputes. An IP right holder shall have the right to file a complaint with any domain name dispute settlement center in mainland China and HK at a low cost during a relatively short period of time (usually about 2 to 3 months) in accordance with DNDRP or UDRP. The panel appointed by the settlement center renders its decision through reviewing documents submitted by both parties. Unless civil litigations are initiated after the settlement procedures, the panel’s decisions shall be executed in the domain name registry directly. Domain name dispute lawsuits have thus been decreased significantly because UDRP and DNDRP provide a more effective and low cost way for the IP right holders to regain their domain names in most cyber piracy cases. Fewer and fewer right holders are willing to choose civil litigations for domain name dispute settlement. Usually, the right holders only initiate infringement suits to settle the disputes which have passed the time limit of two years decreed by DNDRP or have involved torts other than cyber piracy. However, petitory actions increased consequently. They are initiated by respondents who failed in the prior DNDRP or UDRP procedures and were required to transfer their domain names to the complainants in accordance with the panel’s decisions. The factor behind the phenomenon is that the panel’s decision might be stayed in accordance with DNRD and UDRP in the event that the defendant has enough evidences to prove that there are legal or arbitral proceedings initiated prior to or during the domain name dispute proceedings. Under such circumstances, it is the life-saving straw for the respondents who failed in the DNDRP or UDRP proceedings to file lawsuits to affirm their rights and to suspend or even cancel the panel’s decisions. The typical cases in this respect included Jiangsu Wuchan Automobile Trading a Co., Ltd. vs. Dr. Ing. h.c. F. Porsche AG (No.3900 of First Instance of Civil Procedure by Beijing No. 1 Intermediate People’s Court in 2007), Shanghai Red Devil Paint Co., Ltd. vs. (U.S.) Red Devil, Inc. (No.189 of Last Resort of Civil Procedure by Beijing Higher People’s Court in 2008), and Meyth International Consulting Co., Ltd. vs. Mercer (US) Inc. (No. 447 of Civil Procedure by The Supreme People’s Court in 2011). In China, people’s courts hear domain name cases in accordance with nothing but civil substantive and procedural laws and Interpretation of The Supreme People’s Court on Application of Laws in the Trial of Civil Disputes over Domain Names of Computer Network (“Interpretation”). Firstly, complainants enjoy more procedural freedom in the court proceedings and can even be entitled to more substantive gains in comparison with that of DNDRP or UDRP if he chooses judicial procedure for dispute settlement. The complainant shall have three kinds of choices, namely, trademark infringement, unfair competition or dispute only as his cause of action in accordance with the “Interpretation.” Under such circumstances, he may request a uniform hearing and judgment of trademark infringement or unfair competition not related to internet in the court. The typical case in this aspect is Jaguar Cars Co., Ltd. vs. Hangzhou Song Jia Plagg Co., Ltd. (No.36 of First Instance of Civil Procedure by Hangzhou Intermediate People’s Court, Zhejiang Province in 2009). In the judgment of this case, the defendant not only was required to transfer the ownership of the domain name www.jaguarcn.com to the complainant, but also had to pay the compensatory damages amounting to more than 6 million yuan for trademark infringement. At the request of one party, China’s courts even ascertained and ruled that a well-known trademark was involved in that domain name case during the early period. 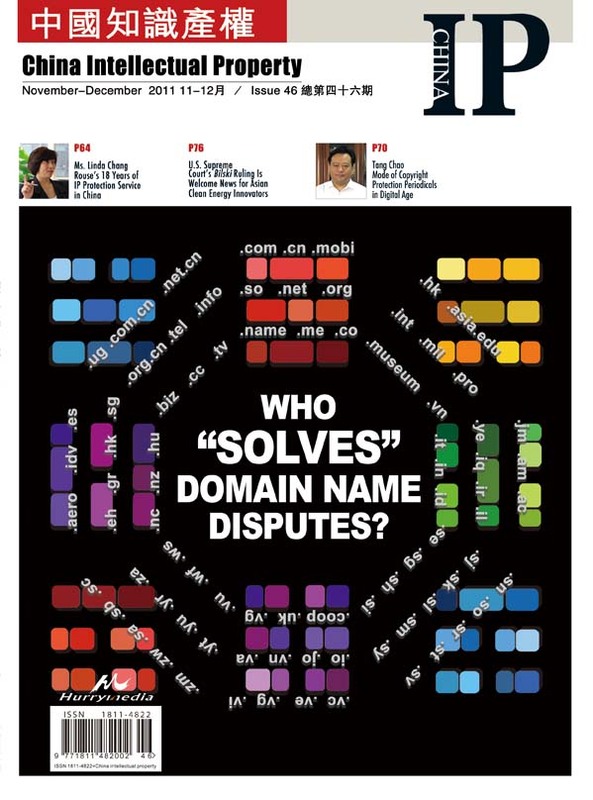 Such phenomenon has become quite rare in pure domain name dispute lawsuits at present, and the court shall not be limited to ascertaining the ownership of domain name in disputes. however, the panel only has the power for initial settlement of the ownership in accordance with DNDRP or UDRP. Secondly, evidences in domain name dispute trial shall be ascertained pursuant to Certain Provisions of The Supreme People’s Court on Evidence in Civil Procedures. This is quite different from DNDRP or UDRP, which is characterized by its simplified methods in ascertaining facts and evidences, and draws attraction from the parties concerned. however, evidences adopted by the panel have often been rejected by courts due to its insufficient satisfaction of requirement of the foregoing Provisions. Therefore, it is very common to see that some complainants (defendants) are defeated in civil lawsuits after their victory in administrative dispute procedure in accordance with DNDRP or UDRP. The reason is that evidences adopted by the panel may not be verified by courts. When the parties come to courts, they need to spend more time and make more efforts, including but not limited to submitting original or notarized evidences, in order to establish their prestige in the industries concerned. They should do so because China’s courts tend to start all over again with little consideration of evidences admitted by the panel according to CNDRP or UDRP. Last but not the least, the scope of priority right adopted by the court may be more extensive than the scope accepted by the panel. The scope varies according to different procedures. It expands from trademark rights (UDRP), to civil rights and interests (DNDRP), early registered domain names, trademarks, enterprise names and other signs with distinctiveness (civil lawsuit). The above-mentioned Meyth International Consulting Co., Ltd. vs. Mercer (US) Inc. (No.1196 of Last Resort of Civil Procedure by Beijing Higher People’s Court in 2010) is a good example in this regard. We should bear in mind that courts safeguard justice, at procedural panel and in substantive sense, no matter a domain name dispute is involved or not. This can be seen from The Supreme People’s Court’s final resort (No. 2011 of Civil Procedure by The Supreme People’s Court of the People’s Republic of China) and its correction (No.1196 of Last Resort of Civil Procedure by Beijing Higher People’s Court in 2010). This means that the judgment shall not be changed even if there is a minor deficiency in one party’s evidence due to procedural reasons when the other party is evidenced that he has had an obvious bad faith in his registration or use of the domain name in dispute. This is undoubtedly in line with the requirement of “substantial justice,” which was stressed in the recent speech by Mr. Wang Shengjun, the President of The Supreme People’s Court.